Before you can get what you want, you first have to KNOW what you want. As a believer in the power of the spoken and written word, my goal here is to encourage everyone to think about your dreams, write them down, and then believe in their reality. Welcome to Write Your Vision! It's hard for me to believe I've not written anything truly personal in almost a year. No blog posts. Minimal journaling. Reduced voice on social media. Despite intense emotion, memory catapults crashing through my present mind, and searing opinions I've been more silent. Quiet. Sad. 2018 began with incredible promise: a new life - new city, new job, new friends, new closeness with family. HOPE & JOY. Almost immediately however that unprecedented joy was tempered with grief. Kristin and I moved to Pittsburgh to be closer to our families. 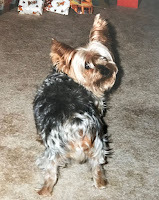 A month after we relocated, our little dog Aspen died unexpectedly. Next Kristin's Gram - the person she was closest to aside from me - was hospitalized. Painful family drama ensued... Kristin decided we needed another Maltese so she found our Ollie (Oliver Fitzgerald) and his energy and happiness renewed our hearts. Within days however we discovered my sweet companion and protector, Austin, our lab mix had a brain tumor. He died followed by my parent's dog Yoda. Despite this also unexpected grief, we opted to go to Italy on vacation in June. We took my parents also as it was their 50th Anniversary... we arrived home and within days, Kristin's Gram passed away suddenly. By chance or grace, she was alone by her bedside that early Thursday morning. The following Monday, our lab Chloe passed away, adding insult to a depth of injury that felt as if we were being pushed underneath murky flood waters. No breath. Death always causes a reaction, usually bringing out either the best or worst in people. Regardless, it demands reflection from those it impacts. Memories. Dreams. The disruptive change it explodes into your world consumes it. God in His infinite wisdom provided us with a way of escape. In our case it was a small 5 lb. 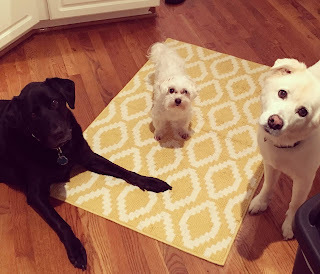 white furball, healthy, playful, and loving along with a joyful new nephew named Jett whose dancing eyes and magnificent smile made your heart sing. All that within four months. July - September felt like a blur. Going through the motions. Working. Solving. The grief fog permeating, suffocating in this new reality. Step by step, we kept moving along - forward, backward, sideways or still. In late September I began a new journey with a group of local leaders in a community focused program called Leadership Pittsburgh where I was blessed by the opportunity to interact with more than 60 new colleagues all of whom were chosen to make a positive, community impact on our city. Incredible gift. At work, I was also blessed with unprecedented grace and favor where my ideas and experience are being welcomed to shape and support change and growth so much so I am being promoted into a newly created role written for me. Another incredible gift. Now, here we are about to celebrate the holiday seasons of Thanksgiving and Christmas (for us). We have another new baby girl who joined our family yesterday - pure joy - while we also prepare for my Mother's knee surgery this week and other hurtful trials whose verdict will impact our family (YES, asking for prayers!). With all this swirl of emotion, memory, and life I am reminded this morning yet again of the enormity of God's grace and love. The power of that love and the faith that propels action. It is so easy to view the world's chaos and deafening confusion as more powerful when the lies that it creates appear to win the day. There is no fear in perfect love. Love is the single, most powerful force in the universe. Love overcomes. When love is lost, the pain of that grief is deafening because the love was so strong. When you witness single acts of hate such as the mass shootings or hear our leaders disparaging remarks, it is again tempting to believe the lies that the negative forces of hate and the deception those things perpetuate... but then in the midst of evil's destruction GOD shows up in a flood of compassion and strength to resist that evil forcing it to flee. And it does flee... our battle is to recognize and resist what attempts to kill, steal, or destroy that LOVE and the actions such love demands: and I remember MERCY (link to teaching: The Way of Mercy). Life doesn't stop for our grief... but God does always provide a way of escape, helpers along the journey to sustain us. Today I choose to embrace that FAITH, HOPE, and LOVE. Today I choose to learn something new about a neighbor, coworker, classmate, or simply someone new I encounter to better demonstrate LOVE and to live in JOY rather than fear or despair. I choose to embrace that power rather than perpetually living under the oppression of criticism, judgment, death or unworthiness spoken to diminish the light burning within. Today I choose to LIVE in fullness and peace. Strength. Wisdom. Joy and abundant favor. Blessing. LOVE. Be who you are meant to be, not who others attempt to shape you into: Resist. Like what you read? Share WYV with Friends! My favorite quote is by RFK: "Some see things as they are and ask WHY, I dream things that never were and ask Why Not?" I am blessed! God has given me a VISION for my life that He continues to fulfill each day...He has taught me that the vision is for an appointed time. By learning to trust His time and His path, my faith has increased with each abundant answer: Life, Health, Marriage, Family, Fun, Purposeful Work.